Traditional “chalk and talk” teaching methods that suited previous generations may not necessarily be effective for students who were born in the digital age. Educating digitally savvy students requires more interaction, visual learning, and collaborative activities, and thus demands more sophisticated technology. At the same time, to work well in classrooms, the technology must be reliable and require minimum maintenance. In this white paper, we show how the NEXCOM OPS media player NDiS M324, based on the Intel ® Celeron ® processor J1900, meets the above requirements. We demonstrate how the NDiS M324’s computing and graphics capabilities enable more modern teaching methods, enrich teaching materials, and encourage participation in the classroom and beyond. We also explain how NDiS M324’s OPS form factor, fanless design, and out-of-band remote manageability enhance reliability and ease of use while reducing maintenance costs. Schools have installed interactive whiteboards to complement lectured-based chalk-and- talk teaching. Interactive whiteboards support content interaction in many ways, including adding annotations to contents, rotating and zooming in/out on 3D images, and engaging multiple students. Schools also record lectures and share them online, enabling students to review a lecture after class and to learn at their own pace. Interactive whiteboards support content interaction in many ways. The utility and versatility of such technology- assisted teaching underlines the need for computing and graphics processing capabilities which enhance real-time content interaction to improve teaching and learning experiences. To this end, the NEXCOM OPS media player NDiS M324 uses the Intel Celeron processor J1900 to enhance the responsiveness of interactive whiteboards. This processor has four computing cores and can ramp up processor performance on demand through Intel ® Turbo Boost Technology. Based on the 22nm Silvermont microarchitecture, this quad-core SoC is part of the recently introduced Intel ® Atom™ processor E3800 product family and Intel ® Celeron ® J1900 and N2910 processors which offer 3X faster computing performance than the Intel ® Atom™ processor N2000/D2000 family. 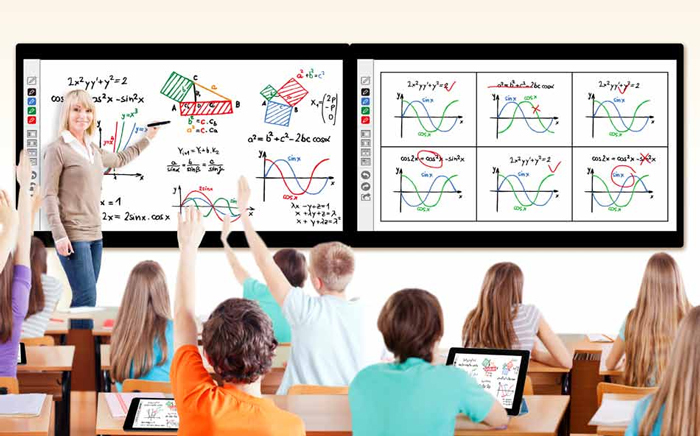 The gain in computing performance enables interactive whiteboards to perform multiple tasks simultaneously and smoothly, as well as support intuitive control. For instance, with the appropriate software and sensors, educators can use a pinch-to-zoom gesture to control contents, write annotations with their fingers, record and save lectures with content changes, and even live stream the lecture to students on remote sites. With the Intel Celeron processor J1900, a course’s contents can include presentations, interactive graphics, dynamic 3D models, and video clips. 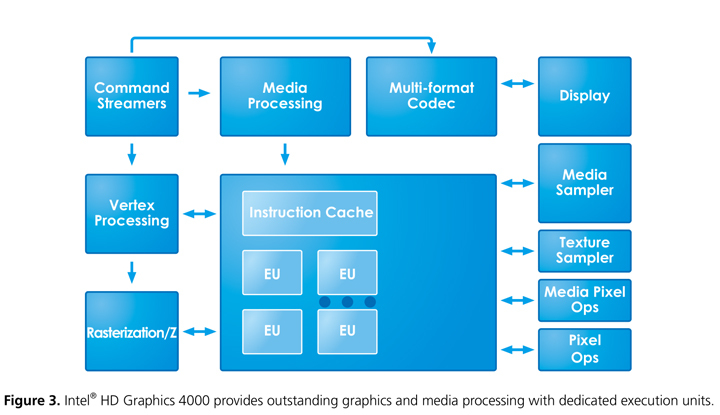 The processor’s integrated Intel ® HD Graphics 4000 enables the NDiS M324 to provide outstanding graphics and media processing for a wide range of content formats, eliminating the expense of a third-party graphics card. Intel HD Graphics 4000 uses dedicated execution units to deliver up to 5X faster performance than the previous generation of Intel ® Atom™ processors. The graphic engine supports Microsoft ® DirectX 11, OpenGL ® 4.0, and OpenGL 1.2 for 2D/3D rendering. The immersive stereoscopic 3D imaging enables educators to resize, move, or rotate contents. These capabilities can be used for everything from introducing abstract basic physic concepts or engaging students in collaborative activities using interactive whiteboards. As for video transcoding, Intel ® HD Graphics 4000 supports full hardware decoding of H.264, MVC, VPG8, JPEG/mJPEG, VC1/WMV9, and MPEG2 formats and encoding of MPEG2 and H.264 formats. In addition, Intel HD Graphics 4000’s support for HDMI 1.4a and DisplayPort 1.1 with maximum resolution of 2560×1600@60Hz and dual displays enables NDiS M324 to play 1080P videos on wall-sized screens. Media conversion capabilities enable the NDiS M324 to broadcast live lectures, rapidly compressing the video to provide smooth, high resolution streaming that won’t monopolize a school’s bandwidth resources. In the digital age, classrooms are no longer confined to physical walls. There are abundant teaching materials and tools on the internet. By incorporating these resources, educators can bring depth and quality of teaching to the next level. The strong backup of online resources also enables educators to prepare a class with less effort and flexibly adjust course progress based on students’ intellectual levels. The NDiS M324 supports internet connection and commercial off-the-shelf (COTS) peripherals through a wide variety of interfaces, including three USB 3.0 ports. This support enables installation of video cameras, student response systems, and other devices designed to improve teaching and learning experiences. By integrating video feeds, the NDiS M324 enables educators to invite experts and professionals around the world to speak at lectures, share knowledge that is beyond educators’ depth, and deliver real taste for a subject. By taking a classroom to the cloud, the NDiS M324 enables educators to use back channels, allowing students to leave comments, share ideas, and pose questions – all great ways to encourage greater engagement in the classroom. Educators can also benefit from intelligent search engines. With supports for nature language, these engines can provide instant answers to topics from mathematics to socioeconomic demography. In addition to satisfying students’ curiosity, a cloud classroom can also provide instant feedback with, for instance, automated essay scoring (AES), to improve student skills. 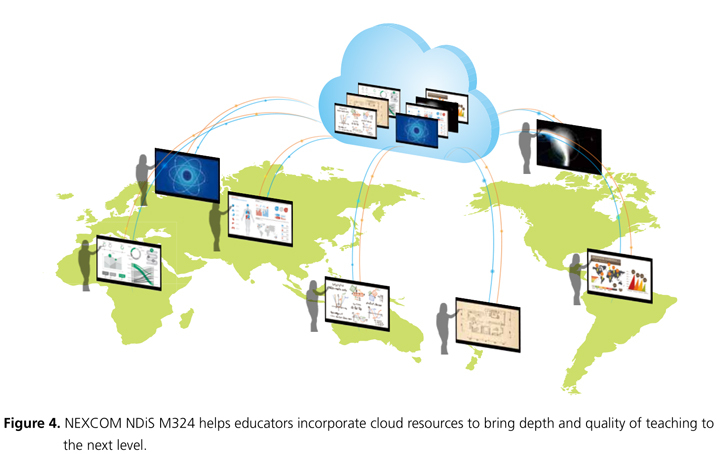 With the NDiS M324’s connectivity, it’s easy for educators to create an environment for active, hands-on learning and collaboration on a global scale. A school campus can occupy a large site – sometimes multiple sites – consisting of a large number of classrooms. To install, maintain and manage media players in all these classrooms can be arduous, time-consuming and expensive. As a result, ease of use, remote management, and Figure 4. NEXCOM NDiS M324 helps educators incorporate cloud resources to bring depth and quality of teaching to the next level. system reliability become important considerations to schools when choosing hardware. NEXCOM provides a unique solution with the NDiS M324, which features OPS compliance, a fanless design, and out-of-band remote manageability. OPS, the Open Pluggable Specification, standardizes the electrical and mechanical specifications for digital signage devices, enabling media players that can inserted into a display to create an all-in-one device. The NDiS M324 comes with the necessary 80-pin JAE connector for insertion in an OPS-compliant display (available from more than 18 manufacturers). This approach reduces wiring, tripping hazards, and malfunctions caused by loose connections. In addition, since the NDiS M324 is designed for fanless operation, it is more durable than media players using fans and provides quiet operation tucked into the monitor in noise-sensitive classrooms. The NDiS M324’s out-of-band remote manageability helps IT staff monitor, recover and reset the player even when the power is off or the operating system is not loaded. Firmware, operating system, and application software can also be updated remotely. This feature improves not only system availability but also management efficiency. For instance, the NDiS M324 can provide IT staff hardware health status. Based on this information, IT staff can identify early indicators of potential problems and analyze the root cause of an existing condition. IT staff can also devise a corrective action before making an expensive on-site visit. If the NDiS M324 requires replacement, the modular design makes it quick and easy. Many media players aimed at cost-conscious markets such as education are only capable of software-level monitoring and control. This means that players can be left down for a long time if they require an IT onsite. On the contrary, NDiS M324 is an entry-level player built with OOB manageability and can reduce the frequency, duration, and manual effort of maintenance and repair. Education in the digital age requires digital solutions. The NEXCOM NDiS M324 with the Intel Celeron processor J1900 provides the digital capabilities in compute power and HD graphics to help educators update their teaching methods to better engage students with interactive learning techniques that inspire minds, stimulate thinking, and spark curiosity. 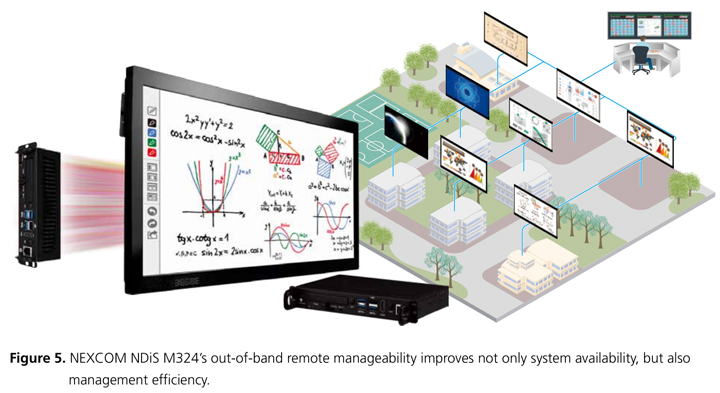 A fanless OPS-compliant media player like the NDiS M324 provides the ease of installation, silent operation, and connection capabilities that educators need to bring the digital age into their teaching methods and reach beyond their walls. In addition, reliable operation and remote manageability minimize system downtime and simplify onsite maintenance.